I've been following the ALARM survey for some years now and for the first time in a very long time, the one-off cost to clear the backlog has reduced. 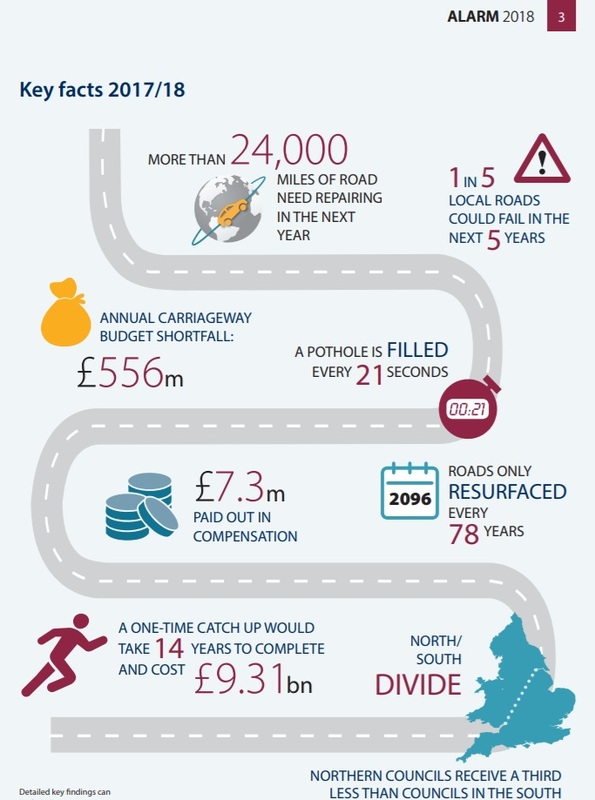 The Annual Local Authority Road Maintenance Survey (ALARM) undertaken by the Asphalt Industry Alliance (AIA) has shown that the backlog has reduced from £12bn to £9bn. That's not because £3bn more has been invested in road maintenance, it is far more complex than that. 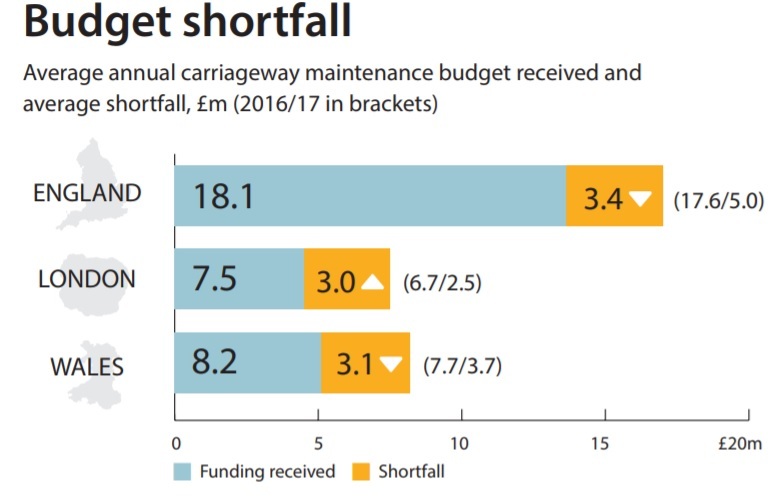 One point to make is that this survey is just about carriageways and cannot reflect the true needs of highway maintenance as a whole and it is only England & Wales. Above, gives some of the key headlines from the full report which gives the headlines. 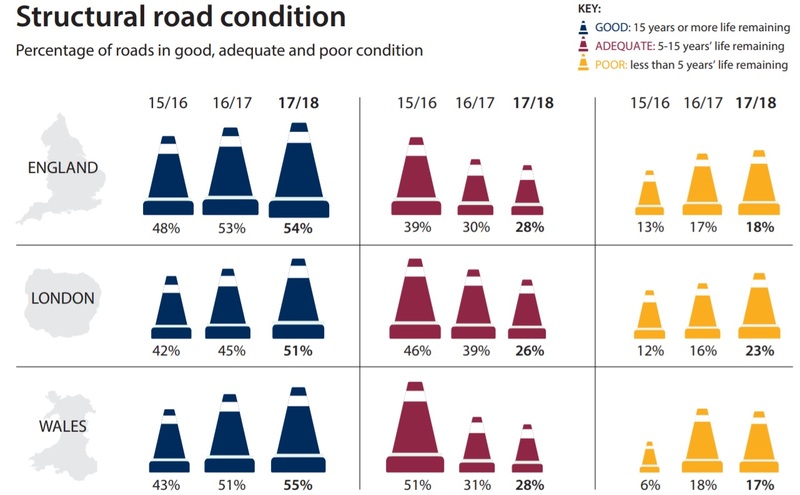 The inference is that main roads are generally those which get the most investment (which makes sense given their traffic volumes), but local roads are being left out. Even lightly used local roads will still be at the mercy of the elements, but the reality is that many (especially in urban areas) are expected to be release valves for the main roads. 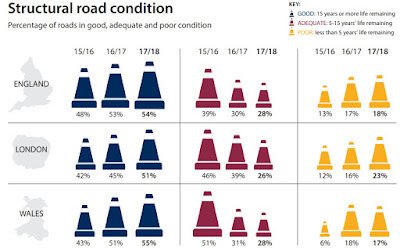 The structural condition reinforces this as we can see a polarisation between "good" and "poor" roads as the "adequate" roads percentage shrinks. "We need to think long and hard about building new roads. If we don’t have enough money to maintain the existing roads, how are we going to be able to maintain new ones?" 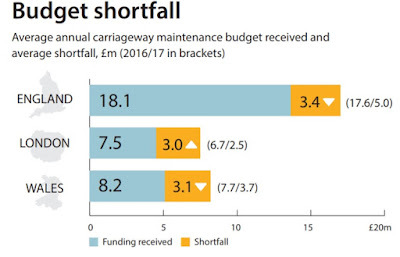 One point Londoners might be interested in, especially after the cuts to London's road maintenance funding, is that the shortfall has increased compared to last year. This will undoubtedly get worse. One of the main problems is that roads are hugely political. At one end of the scale, we have the government dogmatically tied to the notion that building roads is essential for continued growth. That in itself is patently nonsensical because because growth cannot be infinite. At the other end of the scale, we have local authorities being hammered by the gradual removal of funding from central government with their responsibilities growing. In many ways social care is vastly more important than filling potholes, but the local highway network is the one asset that a local authority has which binds the rest of its activities and responsibilities together. We need a different conversation about all of this. In Hertfordshire the County Council no longer adopts roads in new estates except for key through routes. So the Hatfield Business Park roads have to be maintained by the owner. What then happens when residents get this charge passed on? Won't be popular!